Is there anything more fun than strolling through a summer flea market? Years ago, my parents used to drag us to them all the time. My brother and I never complained because - heck, they were fun! My dad used to pick up golf balls (good for water holes) and tools. My mom didn't buy much, but we had fun browsing. I even got my then-boyfriend, now-husband to come with us once. He'd never been to a flea market before, but after that visit he was hooked. These days there aren't very many *good* flea markets out there, but there's one that we try to attend at least once every summer - the Kane County Flea Market. It's about an hour's drive from our house, but always worth the trip. The reason it's so good is because it's chock full of old stuff and there are very few tables of people selling new items. I don't like the new items - not even a little bit. I walk right past all the socks and packaged household goods. I'm there for the fun stuff. I didn't even know they were called Swanky Swigs when we first started buying them. 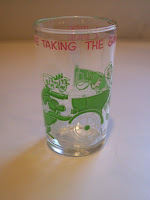 My brother and I remember drinking pop (filled to the brim) from these jelly-jar glasses when we visited our grandparents. Why their pop was always flat, I have no idea. But I digress. 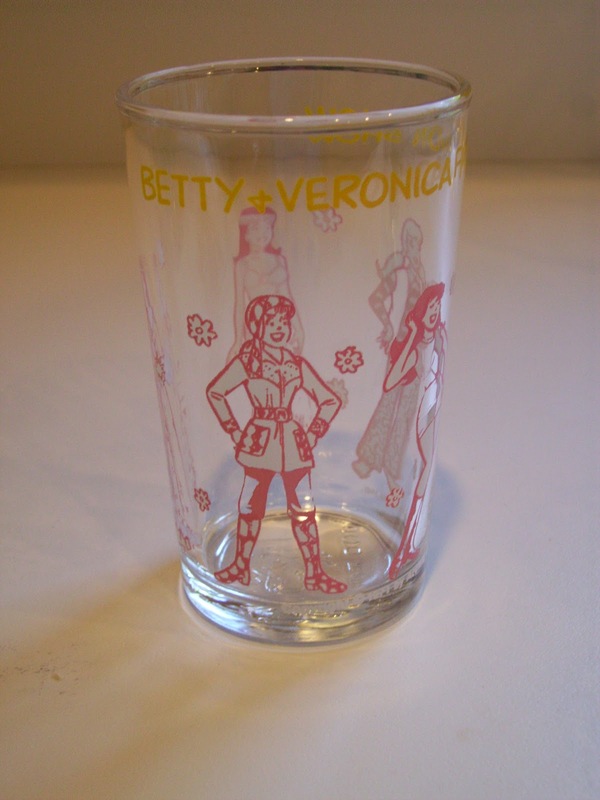 They always had these kid-sized glasses ready for us, some featuring the Flintstones, but our favorite featured the Archies. My husband and I found a few of these at a flea market a long time ago (before we had kids) and I snapped them up mostly because they felt like a way to recapture my youth. But... why not use them? 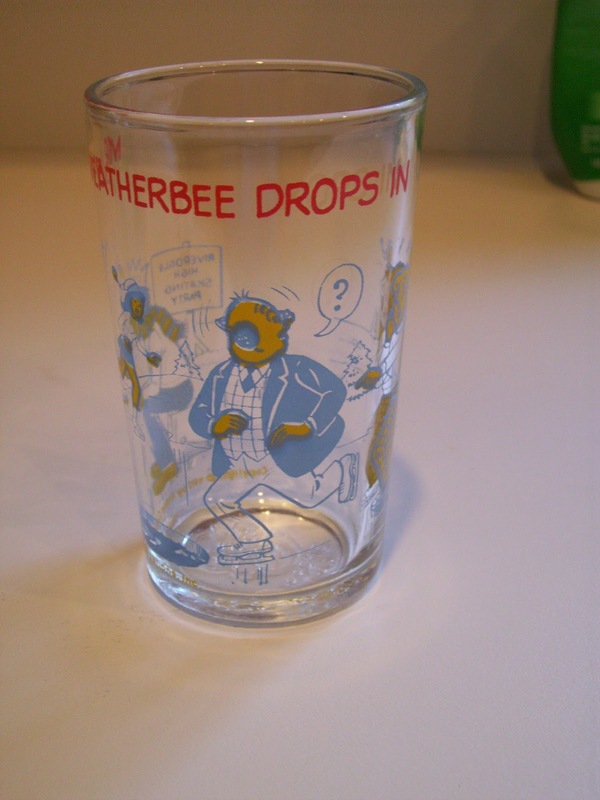 We started serving our kids drinks in these and now, years later, Archie glasses are part of my kids' youth. We scour every stall for them whenever we visit a flea market. I'll pay $2 - 3 without blinking, but when the tag says $8, I'll try for a better price. If they won't come down, I walk away. Once, when the kids were really young -- our oldest might have been eleven, we once found a guy with an entire box of Swanky Swigs for sale. I think he was asking for $5 per glass. 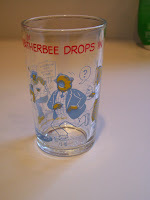 When he saw how excited the kids were to find an entire stash of these glasses, he told me he'd take $20 for the whole box. There were definitely more than 10 in there, so I felt great about scoring a deal. He said he felt great because he knew they were going to a good home and would actually be used. Everybody won. 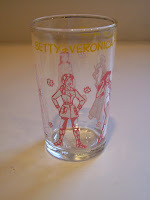 Anyway, here's a picture of *some* of our Archie glasses. There are loads more. 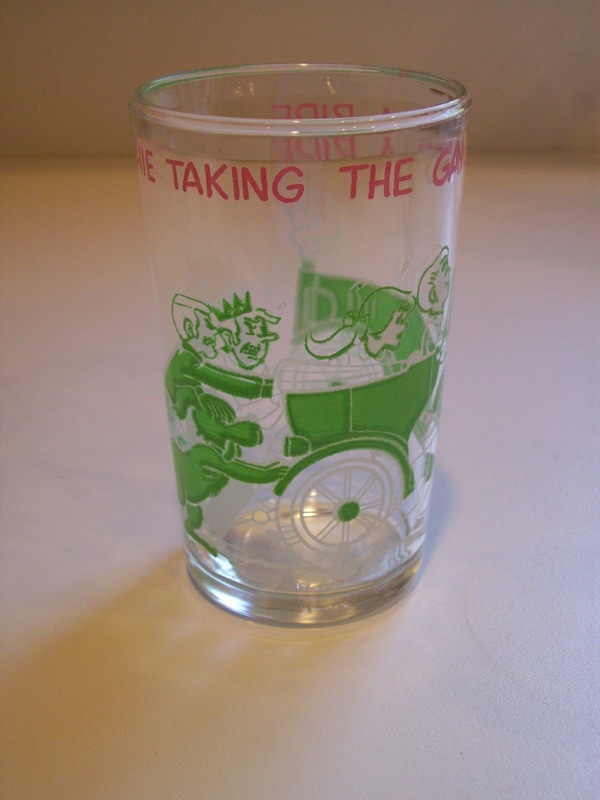 We also tend to pick up Star Trek and Disney glasses whenever we find them. And a few Looney Tunes ones as well. We're rapidly running out of shelf space, but we can't help ourselves. Do you visit flea markets to find treasures? Is there anything you collect that you absolutely can't resist? 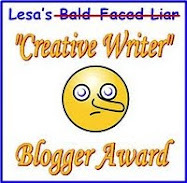 I used to run a stall at a 'flea' market, with a writing buddy. We sold stuff we didn't want (good quality). I have to say, it was the greatest fun!! We got very good at shouting our wares! Can you imagine if we had a 'writers' market'? Boy, would it be noisy!!! LOL--talk about the "small world syndrome." Your grandparents always had flat pop and so did my Aunt Hetty and Uncle Bill. I actually got to LIKE flat ginger ale. Go figure! And you're right about flea markets, they just aren't the same anymore. Now they seem to be full of new Made-In-China stuff. My mom's hometown (Front Royal, VA) used to have a HUGE flea market in a vacant lot on the two main roads in town. Sadly, it got paved over to build fast food joints. We were pretty poor when I was little and my mom would save her spare change to buy me Nancy Drew mysteries. The library never had them and someone had told her they were great books for girls who liked to read. I spent summers (from the age of 6-12) with my aunt and cousins up at their house on top of the mountain above Front Royal. The weekend she would drop me off my mom would fill up boxes with as many new-to-me Nancy Drews as she could afford with her spare change jar. I only read them on the rainy days (too much fun to be had playing outside in the country_ and I tried to read them slowly to make them last but I never could so I just read them over and over again. I can still remember opening the cover to find the penciled price on the inside of the cover. The soda was flat on purpose. My Nana said it was healthier for us because it had less fizz. Aimee, That sounds like me. My Dad would go to yard sales and fleas to buy my Nancy Drew's. I devoured them. I had a big walk in closet that I would grab pillows and curl up in the corner and that was my reading nook so nobody would bother me. Nowadays, I still go to flea markets for old books, never know what you might find. I like going to flea markets, antique shops, and auctions, always fun. I love your glass collection, Swanky Swigs are so cute! I like to buy pretty glasses, also, usually Pepsi or Diet Pepsi glasses, also red or purple ones. Lorna, Target has some new Star Trek glasses, made in USA. 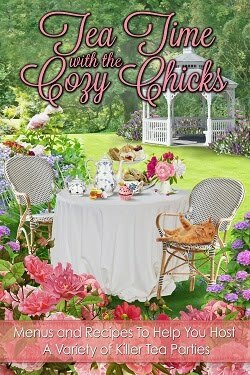 Carol - love the idea of a writer's market LOL! Lorraine - Next time I go, I'll look for a few ST glasses for you! We just replaced a recently broken "Fal-Tor-Pan" on the last trip. Gotta love Trek! Aimee and Jeannie - I still look for Nancy Drew books while I'm at the flea markets. I collected all the yellow spine ones as a girl - and I kept them. Now I'm trying to collect the old blue-covered books. There are even some with dust covers out there. Usually they're too expensive, though. Debra - I remember Nehi! When my kids first encountered it, they pronounced it "nay" and my husband and I had a good laugh about that. Shirley - I love Pepsi glasses. Pepsi has been the sponsor of so many glasses I love, btw. I'll have to check Target for the ST glasses you mentioned. Too cool! Great post! 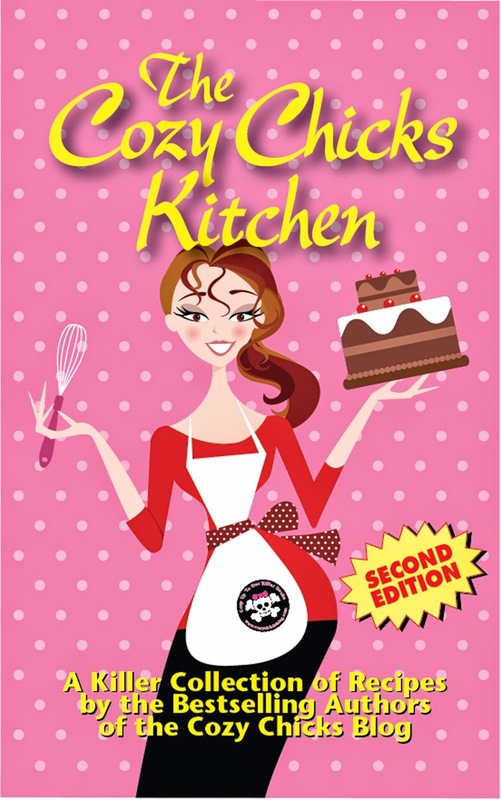 I used to love going to the fleemarkets, looking for books mainly, but also "things". Nowadays all my buying is done on the internet, which at least saves on the entrance fees which are often quite high and very disappointing when I don't find anything I don't want.